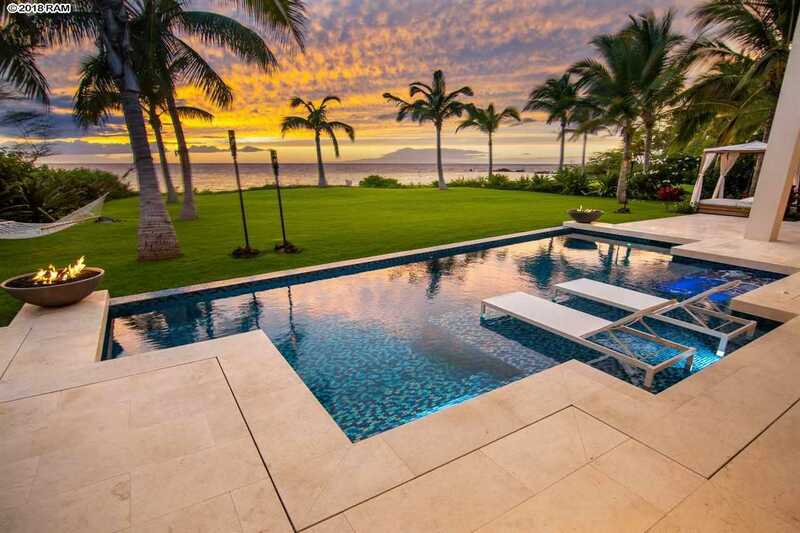 Hawaii Beachfront Living Redefined. Introducing one of the rarest offerings to ever come on the market. The brand new construction, fully-furnished home offers a quiet getaway on one of the most exclusive beaches on Maui while being within walking distance to some of the finest luxury resorts in Hawaii along the Wailea Beach Path. The magical location is steeped with Aloha as it was once the focal point of an ancient Hawaiian village and is now a nesting beach for the critically endangered Honuâea (Hawksbill Turtle). Constructed with the utmost craftsmanship using the finest materials curated from across the world, the interior living space seamlessly transitions to the spacious covered lanais to best partake in the Hawaiian lifestyle. Masterfully designed, the Great Room is inviting with its 20' cathedral ceilings, white limestone flooring in museum grout, raw stacked coral on selected walls and open living floor plan. A chef's dream gourmet kitchen awaits, with high-end appliances (Sub-Zero, Wolf, Boesch) anchored by the elegant Caesarstone countertop and handmade sink. The game room is positioned perfectly as timeless ocean views frame memories of a lifetime. Dual Master Suites offer convenience, with the ground level Master Suite featuring an expansive adjoining lanai extends to the pool, while the second floor Master Suite is a serene private retreat, with its wide lanai encasing multi-island views. Bathrooms showcase world-class finishes and materials with timeless, elegant design. The iridescent tile pool with spa provides resort-level living in the comfort of home, while the picture-perfect, silky sand Palauea Beach presents a plethora of water activities - snorkeling, swimming, kayaking, paddle boarding and more await. A truly captivating property to inspire an incomparable life of discreet luxury. Please, send me more information on this property: MLS# 380542 – $29,980,000 – 4508 Makena Rd, Kihei, HI 96753.